Home course for the Minnesota Finlandia and Snowjourn races. It's a great course with lots of ups and downs and mainly in the woods. Skate and classic trail through state land and a red pine plantation. Long and mostly gradual climbs, one technical downhill corner. Beautiful views along the ridgeline. Trail runs through red and white pine and tamarack bog, and beside Lake Lyra. Nice classical trails, some close to the shore of Lake Bemidji while rest is deep in the woods. Site of Candlelight ski tours and annual Volkslauf ski race. Located in the heart of the city of Bemidji, close to many hotels and restaurants. Two km of lighted track. Ideal trail for beginners. This steep hilly area is the favorite training ground of local racers. Trail is through black spruce bogland, red pine and mixed hardwood. Great rolling hills and sweeping corners -- entirely in the woods. This is an area of exceptional beauty with trails winding along Three Island Lake and Turtle River. Great trails expertly groomed at Maplelag. Mainly classical but some skating loops too. Trails flow around the base of Detroit Mountain downhill area. Mixture of trails with hilly segments and more gentle terrain. Located just west of big Detroit Lake. Flowing trails with moderate hills through the woods. Groomed by local volunteers. Opened winter 2009-10. Located in the Tamarac National Wildlife Refuge. Trails wind through one of Minnesota's finest and largest remnant prairies, along the Buffalo River. Located in the Deep Portage Conservation Reserve, the trails are rated novice to expert. Another set of trails within the Foot Hills State Forest, these are rated from novice to expert. Trails are rated easy. The park plans to add 2.3 more miles of trail to the system for winter 2000-2001. Easy to moderate classical groomed trail through hardwoods and mixed pine stands in the Chippewa National Forest. Only the parking lot off County 5 NE is open in the winter. Lighted trail along the Red River. Adjacent to the Hjemkomst Center. Park in the lower (west end) of the Hjemkomst lot and walk 50 feet north to get to the trail. Here you will find the Headwaters to the Mississippi amongst towering pines. Trails are easy to difficult. Groomed classical/skate trails wind through a varied forest, ranging from baby aspen to mature balsam and pine. Trails vary from easy to advanced. There is also a one-mile blazed showshoe trail, warming house and outdoor toilet. 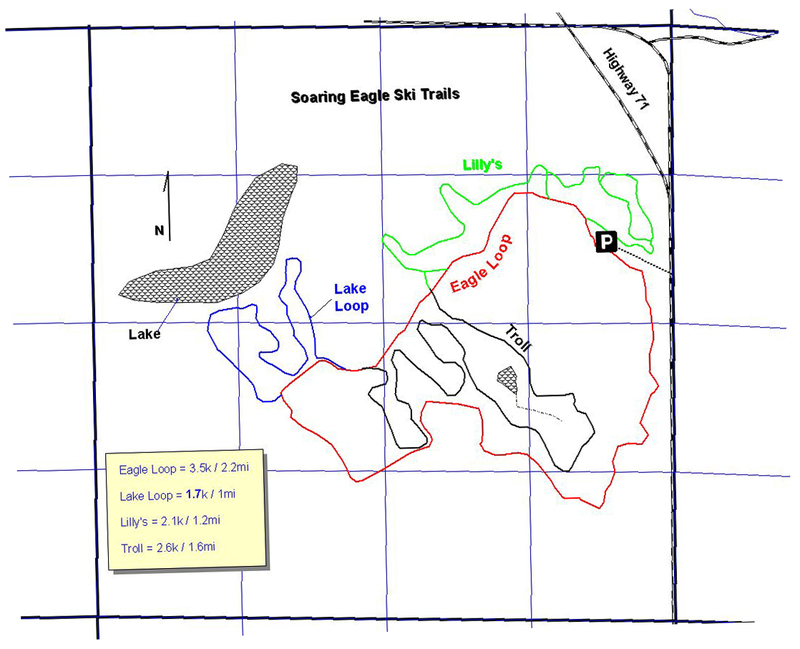 Located in the Foot Hills State Forest, the trails are rated from novice to expert. Scenic views are numerous. The land is generally flat, except ridges and river valleys formed by glacial activity. Running along the slopes of the Shingobee River Valley of the Chippewa National Forest, these are rated from novice to expert. 3k are now being groomed for skating. 6K groomed for skating and about 12K groomed for classic. Trails are definately beginner friendly and pass through a variety of forest types including jack pine, birch, aspen, spruce-balsam and some low-land brush. One section passes through an old gravel pit.